The living room is a place where everyone can gather and have fun. It is likely to be the centrepiece for a house. Whether it’s just for family lounging or watching TV, living rooms are always the focal point. 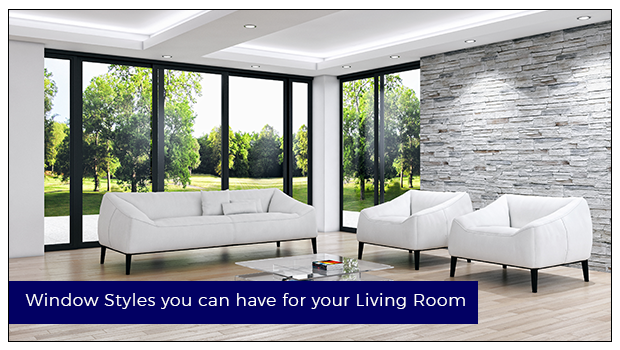 Every element that constitutes a living room speaks about your personal style. When it comes to picking from the different types of windows available in the market for a living room, it’s important to look for aspects such as light and ventilation. So, when it comes to choosing the right window styles for your house, you should select an option that enhances your favourite and the most important space in a house. – Window features be it ventilation or other properties such as noise proof, dust resistant, etc. –Your personal style that will impact the look and feel of the living room. -Extras like decorative glass, window grilles, to keep things one step higher and create a more personalized living room. Among the different types of windows, sliding windows are for people who are looking for a space that provides ventilation. The sliding uPVC window styles are easy to operate and at the same time ensure swift horizontal movement with assured security. Be it an unobstructed view of the outside world or the sunlight, casement window styles work every time. Among the different types of windows, this one offers maximum air circulation to keep your home fresh. You can even style it like a Villa window or a French window as per your wish. The double seal system that reduces sound and improves energy efficiency. Sturdy hardware that doesn’t rust or corrode. Your quest for unique custom-made windows ends here. The custom-made Arch window styles are ideal for your living room window style, which makes it a little different from the other types of windows in the market. You can also tailor the windows with the sash, mesh, grill, and hardware of your choice and make your living room look the best. Combination windows are one of the popular window styles that you can incorporate in your space. These types of windows can be tailor-made and can give you many attractive frame options. Besides offering design flexibility, these window styles also provide excellent thermal insulation. Customization of size, shape, color, etc. Double/ triple glazing that ensures better thermal and sound insulation. So, what are you waiting for, get your custom made windows by picking the right window styles available for your living room to look fabulous.